STORY OF ITS REMARKABLE GROWTH AND PROGRESS. FROM A SMALL FOREST TOWN TO LARGE INDUSTRIAL CENTRE. And the twanging bow no more. Past the heath and up the hill. Old Lime Tree Place, Mansfield. In the neighbourhood of Mansfield there appears to have been a Roman camp or station, for in 1787 the foundations of a Roman villa were discovered, and encampments are said to have existed at Berry Hill and Pleasley Park. Roman coins have also been found in or near Mansfield, a jar containing 500 silver ones being unearthed in 1849 during the construction of the Mansfield and Nottingham railway. There appears to be not the slightest doubt as to our early monarchs hunting in the Sherwood Forest. Long prior to the coming of Normans the Mercian kings came here to hunt, and legend states that they granted privileges to the Forest town of Mannesfield. But it is certain, says Horner Groves, that King John frequently came to Mansfield between the years 1200 and 1216. It was here, too that Richard Coeur de Lion received the congratulations of the Scotch King on his return from the Crusades. But we cannot here trace the whole of Mansfield's early history, owing to limitations of space, but the following extract from the "Annals of Nottinghamshire" is interesting:—"About the year 1163 there was residing at Cuckney a man named Gamelbere, who was an old knight before the conquest, and who held two carucates of land by knight's service or tenure, of the king, in chief, by the shoeing the king's palfrey, upon all four feet, with the king's nails, or shoeing materials, so oft as he should be in Mansfield; and if he put in all the nails the king should give him a palfrey of four marks value, and he was to forfeit the same to the king if he lamed the horse, pricked him, or shod him straight." The district surrounding the borough is full of interest. To the south, but four miles away, is Newstead Abbey, the home of the Byrons, about which Horace Walpole wrote in 1760:—"Newstead delighted me. There is grace and Gothic indeed—good chambers to a comfortable house." Hardwick Hall, built by Bess of Hardwick, a very fine Elizabethan mansion belonging to the Duke of Devonshire, lies to the west, and north there is the beautiful tract of forest land known as the "Dukeries," where the Duke of Portland, the Duke of Newcastle and Earl Manvers reside, at Welbeck Abbey, Clumber and Thoresby respectively. There is also Rufford Abbey, the seat of Lord Savile, some seven or eight miles away. Mansfield was the birthplace of Archbishop Sterne, Master of Jesus College, Cambridge, and Archbishop of York. He was one of Laud's chaplains, and was present with him on the scaffold. He was grandfather of Laurence Sterne, author of "Tristram Shandy." But the most interesting son of Mansfield is certainly Robert Dodsley, the famous London bookseller and publisher of the eighteenth century, who lies buried in the churchyard at Durham. Other celebrities deserving of mention are:—Samuel Jebb, the editor of the Works of Aristotle, who died in 1772; Dr. Jackson, late Bishop of London; James Murray, the inventor of the circular saw; Henry Ridley, M.D., the author of many learned medical treatises; the celebrated Earl of Chesterfield, D.D. ; and William Chappell, Bishop of Cork and Rosse. The parish church is a very interesting building. In the Domesday Book we read: "Here are two churches and two priests." Undoubtedly, one of these churches was St. Peter's, but all trace of this early church has disappeared. The oldest portion of the present fabric is Norman, belonging to the end of the century in which the Domesday Book was compiled. Of this building the only really important part remaining is the lower portion of the tower. Just before this Norman portion was built the church, together with those of' Chesterfield, Ashbourne, and Ossington, was presented to Lincoln. With this gift went all the chapels, that is, the daughter churches, of the hamlets, and the great tithes. Early in the sixteenth century a lady, whose name is well known in Mansfield to-day, and after whom a street has been named, lived in the town—Dame Cicily Flogan. She was a widow, imbued with the doctrines of the times, including the belief in the efficacy of masses for the souls of the departed. In 1521 she made her will, leaving certain lands, the profits of which were for 99 years to maintain a priest to sing masses. In the south aisle of the parish church can still be seen the aumbry and piscina belonging to the altar where the priest chanted his mass. Lady Flogan's chantrey was not destined to run for the period she had laid down in her will, for in 1548 a survey of all chantreys was made and their property and goods seized. 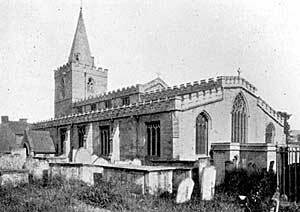 Money for the building of St. John's Church was provided, in his will, by Mr. Gaily Knight, of Warsop. He left £6,000 for the purpose and the whole of his Firbeck property, which realised between £65,000 and £70,000, went to the Ecclesiastical Commissioners for the building of churches and parsonage homes and for the augmentation of small livings. St. Mark's Church, on the Nottingham Road, is of more recent date. There is an interesting brass plate on the reredos at the Old Meeting House (Unitarian) in memory of tbe conscientious sacrifices and Christian labours of the ejected ministers, who found in Mansfield "a little Zoar, a shelter, and a sanctuary," and who gave up their livings when the Act of Uniformity came into operation in 1662. No fewer than 40 of these ejected ministers resided in Mansfield. After the passing of the Toleration Act many of them returned to their own homes. Let us turn for a moment to what may be described as modern Mansfield. From a comparatively small town the borough, in less than twenty years, has grown into a thriving and industrious mining centre. The development of the coal to the east has been mainly responsible for its growth. Many miners employed at pits in the Leen Valley, and at Pleasley, Warsop Main, Shirebrook and Langwith reside in Mansfield, and special railway facilities are provided to convey them to and from the pits. The trains by which they travel are locally known as "Paddy's Mail," and the accommodation is reserved for those employed in the winning of coal. When the last census figures were published Mansfield was shown as having increased, in regard to its population, by between 80 and 90 per cent., and there was. only one town in the country—Coventry—that showed better figures in this respect. Houses were erected in pre-war days at the rate of from 400 to 500 per annum whilst the boom was on, but the outbreak of hostilities put an end to building, with the result at the time of writing there is a dearth of houses. The demand, however, for more houses is to be met by the Municipal Authority. At a meeting of the Town Council, held in January of this year, 1919, resolutions were adopted approving of the purchase of land, running into a cost of thousands of pounds, for sites for working men's dwellings. In all, it is proposed to build 1,500 houses. When these are inhabited it will mean an increased population of 7,000, which will carry the aggregate number of residents to well over 50,000. 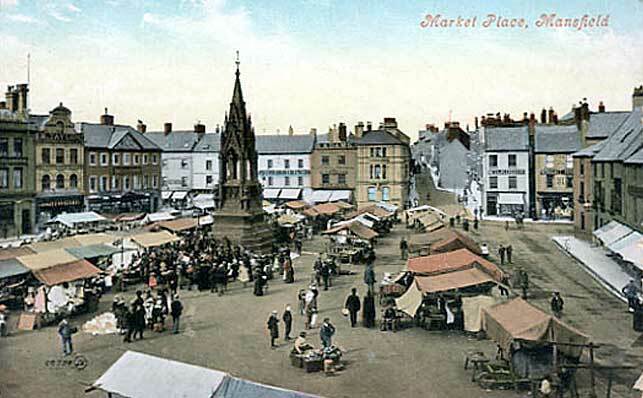 Within a five miles radius of the market place there is a population of more than 150,000. These outlying districts are linked up with a system of tramways. There are four lines, viz. : to Huthwaite, through Sutton-in-Ashfield; to Pleasley Hill, which although three miles from the Town Hall, is in the borough boundary; to the Mansfield Colliery, which serves the Forest Town folk; and the Nottingham Road route. In May, 1919, the Light Railway Commissioners granted an application by the Mansfield and District Light Railways Co. for authority to extend their lines to Rainworth and Clipstone. With reference to the apprehended effect of competition upon the Mansfield Railway, and consequently upon the Great Central Railway, by the proposed light railway through Forest Town to Cliptone colliery, the representatives of the railway companies deposed that the accommodation and facilities which have been provided by them for Clipstone Camp would be maintained and adapted to the village which was now designed to occupy the place of that camp when the works at the colliery were resumed. In that case the Commissioners were of opinion that the construction of the railway to Clipstone should not proceed beyond the Clipstone Park Drive Lodge, or such less distance as would prevent undue competition without unduly disregarding the public interest and the conditions of work and of residence now establishing themselves in the colliery district round Mansfield. The railway facilities have greatly improved of late years. A small length of line, promoted by the Mansfield Railway Coy., and worked by the Great Central Coy., links up that company's lines at Clipstone and Kirkby-in-Ashfield, and thus reduces the distance from the north-east to London. Fish from Grimsby to the Metropolis is carried by special trains over this route. The new line is of great advantage to passengers from Mansfield to London, the journey of close upon 140 miles being covered in just over three hours. The Midland Company, who had a railway monopoly in the borough until the construction of the line just mentioned, have also a good service to London, and in normal times run a large number of trains to the county town. Regarding the government of the town, the charter of incorporation was granted on June 2nd, 1891, at which time the census showed the population to be less than a third of what it is to-day. The Corporation have their own gas, electricity and water undertakings, and all have been able to contribute to the relief of the rates out of profits. In 1823 an Act was obtained by a company for lighting the town with gas, and in 1878 the Gas Light Coy. sold the undertaking to the Improvement Commissioners for £37,500. Much has been done since then by way of improvements and extensions, and the total expenditure on capital account is more than three times the sum named. The water supply for the town and a wide district is obtained from Rainworth and Clipstone, the first-named being the older well. Excellent quality is the water obtained from both places, and the town is fortunate to possess such an abundant and pure supply. In 1870 an Act was obtained by a private company for supplying Mansfield with water, and this authority continued to own the undertaking until the year 1889, when the Improvement Commissioners bought it for £29,850. As the supply was unsatisfactory, both for quality and quantity, steps were at once taken to improve it. Over £21,000 was spent on the pumping station, reservoir, and mains in connection with the Rainworth supply, and at Clipstone some £28,000 was expended to augment the Rainworth supply. The electricity undertaking has also been a source of revenue to the town, and it is proposed to carry out extensive additions as soon as the necessary permission can be obtained. The site of the works formed part of Burdon's Estate in Ratcliffe Gate, and 10,813 yards were purchased under the provisions of the Mansfield Corporation Act, 1901, for £3,694, under the Act mentioned and the provisions of the Electric Lighting Order, 1899. The total capital expenditure up to the end of 1912 was £77,699. Mansfield is particularly well off for educational facilities, for it has a long list of modern elementary schools, three of them—Rosemary, King Edward and Broomhill—cost over £46,000. Higher education is provided at the Queen Elizabeth's Grammar Schools and Brunt's School. 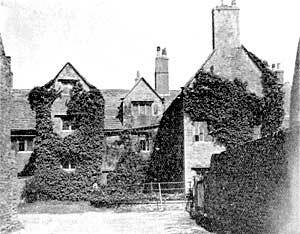 The first charter for a Free Grammar School was granted to the vicar churchwardens, and eight assistants by Queen Elizabeth, and the first school house was built in 1567, and the present buildings erected at a cost of £10,000 in 1877. Many additions have been made since then, however. On the Woodhouse road the Girls' Grammar School is situated, and was built at a cost of half that of the boys' school, the Duchess of Portland laying the foundation stone in 1890. Brunt's School was established under a scheme prepared by the Charity Commissioners, the necessary funds being drawn from Brunt's Charity, which was remodelled for that purpose. The Grammar Schools are a centre for the Cambridge Local Examinations, and Brunt's for the Oxford "locals."